When this generation thinks of the term “trending,” images of Kanye West, Donald Trump, or the Super Bowl may appear. Trending is defined as a topic of several social media posts in a short period of time. Depending on the time of year, different events or concepts receive lots of attention. Many people may not think about synchronized swimming, but during the Olympics the topic could easily start trending. In the world of education, trending has been around much longer than social media. Common Core, Professional Learning Communities, Phonics, and Positive Discipline are all topics that were hot and highly discussed. Some topics are very short-lived, while others have stood the test of time. Each time a new idea pops up in education, many teachers become skeptical because there is no time for trending in the classroom. Among the current conceptions receiving much attention is the use of higher-order thinking skills in the classroom. References to this idea can be found in recent scholarly articles, on teacher evaluation rubrics, and in some state legislation. However, while higher-order thinking may be trending, it certainly is not a new educational reform. 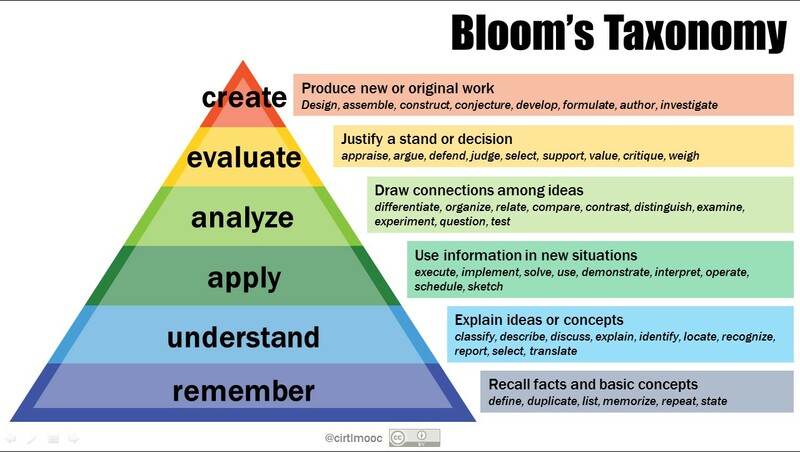 Higher-order thinking skills developed its roots in Bloom’s Taxonomy, which classifies learning objectives into specific levels based on complexity and mastery of skills. Often depicted as a pyramid, Bloom’s Taxonomy constructs its domains as a stacking of skills where you grow from the most basic to the most advanced. Ideally, a teacher can take a learning objective and build upon it by moving questioning and activities further up the pyramid until you reach the top. Students move from simply memorizing information to developing their own original work based on the original educational standard. The middle school, or junior high, years are a time where students are expected to move from developmental knowledge to applicative knowledge. At this age, it is more common for teachers to embed application and analysis skills into their lesson planning. This approach can sometimes lead to a lack of scaffolding for students. The expectation of independent learning for students can leave a student floundering. Education reforms will continue to trend in the future as they have in the past. As with any professional development workshop a teacher may attend, there is always something positive you can take away and use in your learning environment. Initiatives such as the integration of higher-order thinking skills as a standard in the classroom can move students away from simply regurgitating facts and take them to a level of thinking where they can become active developers of their own minds.